Click here to view current Cardiology opportunities. 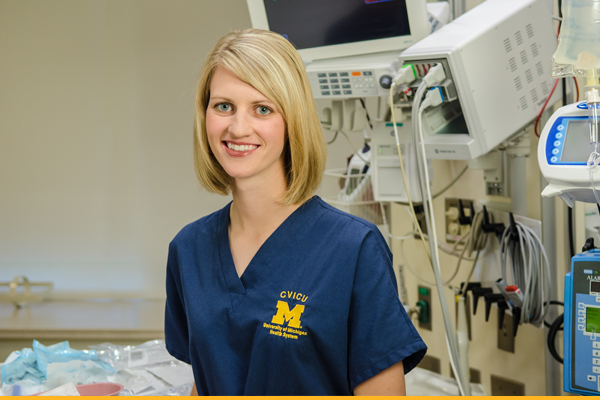 The University of Michigan Health System is dedicated to providing comprehensive cardiovascular health services to the residents of Michigan and beyond. UMHS is proud of our strong reputation for leadership and excellence in the fields of cardiovascular research, surgery and patient care. Our long-standing commitment to exceptional care has led to the creation of a new state-of-the-art Cardiovascular Center – uniting the University’s incredible clinical and research resources, with the area’s top-quality specialists. A 10-bed unit dedicated specifically to the care of critically ill cardiovascular medicine patients (ranging from adolescents to the elderly), who are experiencing acute or chronic illness. It is the primary aim of the CICU nurses to work as members of a comprehensive health team, focused on restoring patients to an optimal level of functioning. Additionally, team members are essential in establishing and maintaining constant communication between the patient and family/significant others, as part of the overall patient care process. Common diagnoses within the unit include: acute myocardial infarction, acute coronary syndrome, heart failure, all types of cardiomyopathy, pulmonary artery hypertension, unstable dysrhythmias, valvular disease, cardiogenic shock, septic shock, heart transplant and left ventricular assist device evaluations, heart transplant complications and multisystem organ failure. Patients may require life support measures, continuous ECG monitoring, invasive hemodynamic monitoring, mechanical ventilation, inotropic and vasoactive drug support and aggressive medical and nursing care. Commonly seen advanced technologies include: continuous renal replacement therapy, intra-aortic balloon pumps, pulmonary artery catheters, esophageal dopplers monitoring, temporary and permanent pacemakers and invasive, induced hypothermia. A 24-bed intensive care unit comprised of adult patients who have recently undergone or, in some instances, are to undergo cardiovascular surgery. The CV-ICU provides technologically advanced care, through a highly integrated and cooperative effort of the nursing staff, physicians and other allied health professionals. The staff of the Cardiovascular Intensive Care Unit will provide excellent nursing care with respect, compassion, and knowledge to the critically ill patient and their family. Through professional collaboration with other health team members, evidence based practice and guidance from the American Association of Critical Care Nursing Standards, we strive to achieve distinction in a caring, safe, and supportive environment. Prevalent diagnoses within CV-ICU include: valvular stenosis or insufficiency, coronary artery disease, cardiomyopathy, abdominal and thoracic aneurysms, and end-stage chronic obstructive disease (COPD). Common treatments provided include: valve replacement or repair, coronary revascularization, ventricular assist devices (VAD), heart transplantation, open and endoscopic aneurysm repair, lung transplantation and reduction pneumoplasty.